How Crystal Meth is produced only takes a little research on the internet and an investment of a few hundred dollars in over-the-counter medications and chemicals. The drug can be made in a makeshift "lab" that can fit into a suitcase. Some intelligence figures suggest that the average Crystal Meth "cook" teaches ten other people how to make the drug each year. The production required to make methamphetamine from precursor substances is easier and more accessible than ever. Over-the-counter cold and asthma medications containing ephedrine or pseudoephedrine, red phosphorous, hydrochloric acid, drain cleaner, battery acid, lye, lantern fuel, and antifreeze are among the ingredients most commonly used. These precursors are substances that, in nature, might be inactive. However, how Crystal Meth is produced combines these chemicals and the result is a new product. Methamphetamine starts with an inactive or marginally-inactive compound (ephedrine or pseudoephedrine) and other chemicals are added to produce the drug. Abusing meth for an extended period of time can result in symptoms similar to those of Parkinsons disease (a severe movement disorder). As a meth user continues to take the drug their behavior becomes unpredictable. They may be friendly and calm one moment and then become angry and terrified the next. 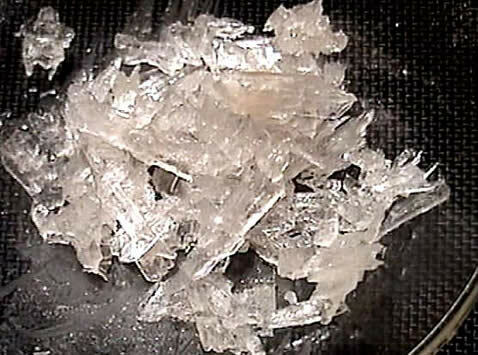 Crystal meth activates the central nervous system and stimulates the production of two neurotransmitters, norepinephrine and dopamine.At low doses, it boosts alertness and blocks hunger and fatigue. At high doses it produces a "rush" feeling of euphoria that can last for more than twelve hours. The National Survey on Drug Use and Health in 2008 shows that from 2002 to 2008, past-month use of methamphetamine declined significantly among youths aged 12 to 17, from 0.3% to 0.1%, and young adults aged 18 to 25 also reported significant declines in past-month use, from 0.6% in 2002 to 0.2% in 2008.